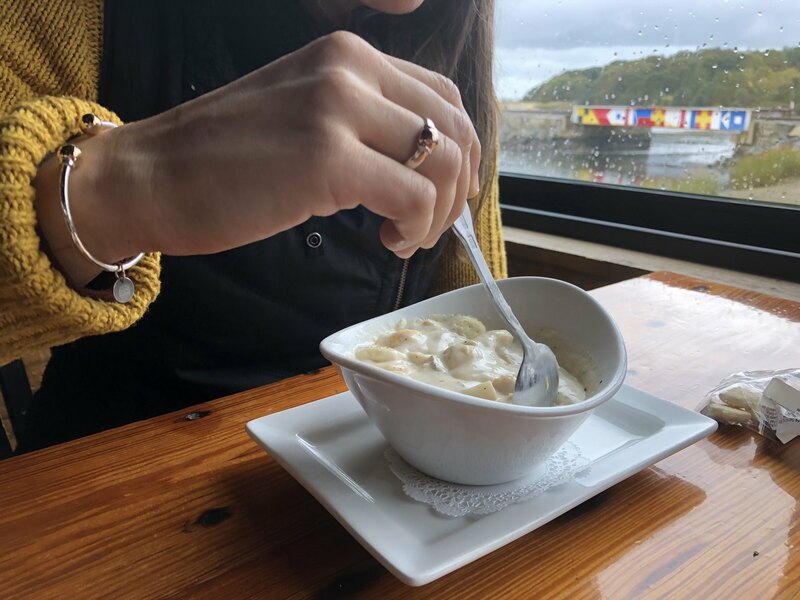 Hearty and comforting, clam chowder is a staple menu item at virtually every eatery on the Cape and coastal New England. It’s appropriate for a cool summer evening, and even more delicious and satisfying when the weather turns crisp and the last summer visitors return home. Unlike the Lounge, the Lobster Trap has evolved quite a bit over the years. Back in the early days, the Trap was nothing more than a fish marked attached to a BYOB fried seafood shack, with plastic tables and chairs on a rustic wooden deck area overlooking a beautiful estuary. On summer nights, my parents would pack a cooler with cold beer and peanut butter and jelly sandwiches for my sister and I, while they enjoyed plates of golden-fried flaky fish. The Trap’s current owners, the Delancy brothers, have a creative vision that transformed it into an award-winning dining destination. Alongside the classic fish and chips, you can now enjoy entrees like seared scallops over risotto and ahi tuna pad thai. And the chowder? Creamy, but not too thick. Subtle seasoning. And chock full of clams! I counted at least one clam in every bite, giving this chowder the highest clam density of all that I sampled. As always, the Trap is definitely worth the trip. While many spots on the Cape boast an appealing sense of nostalgia, the Silver Lounge trumps them all. 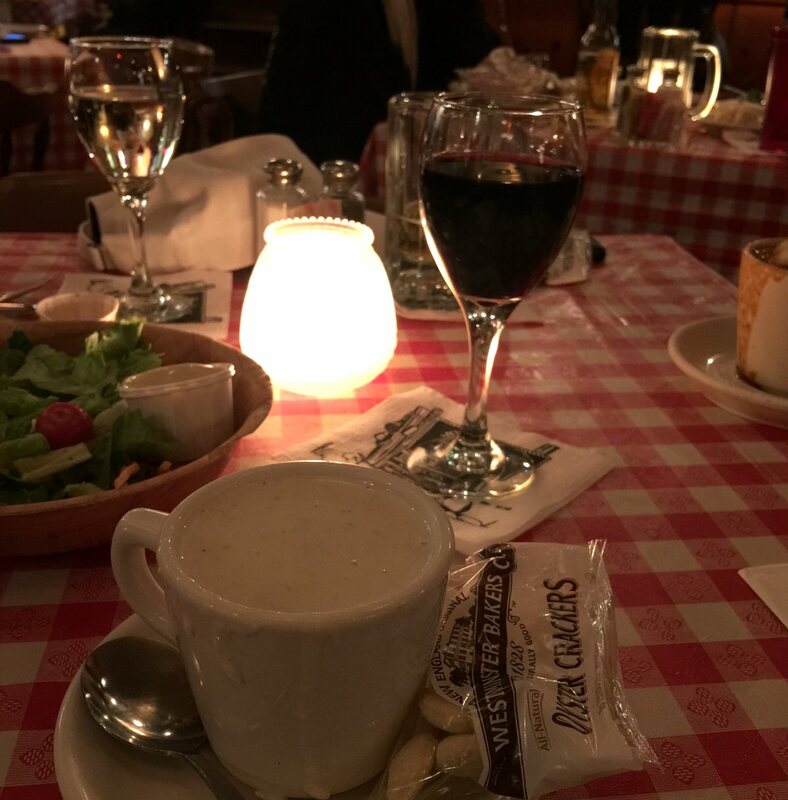 Founded in 1938, the Lounge has barely changed– the classic checkered tablecloths, frosted glass candle-holders, and antique buoys hanging from the ceiling create a cozy atmosphere. I remember visiting the Silver Lounge with my entire family as a young kid. While the adults finished their meals, we young ones would wander into the adjoining country store to fill a bag of penny candy. 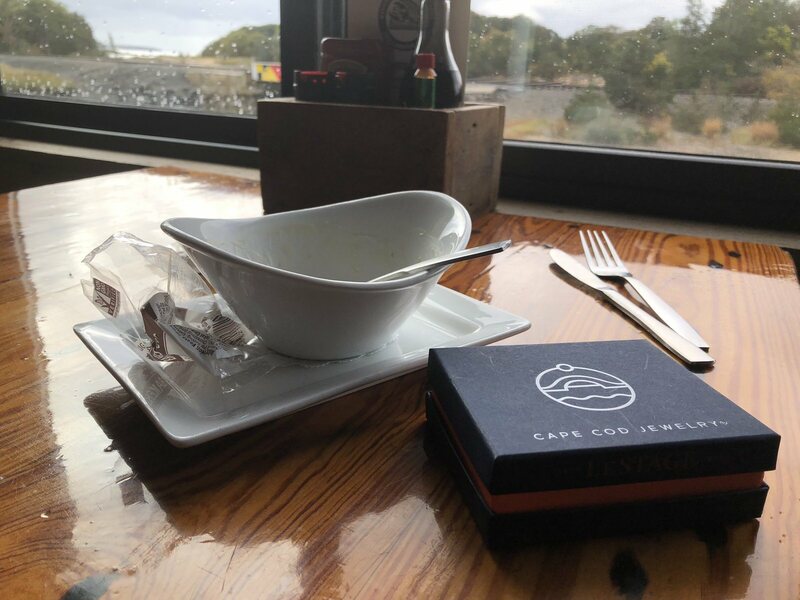 The clam chowder is much like the restaurant itself. 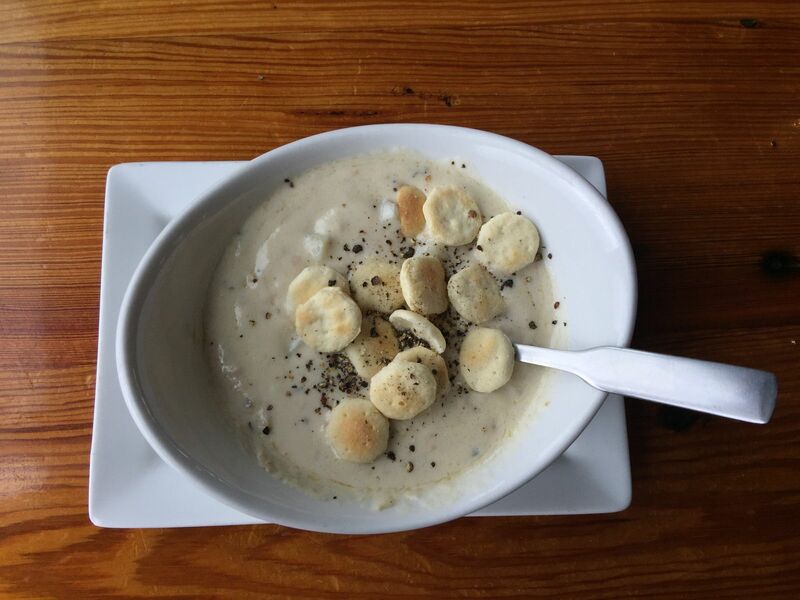 Nothing surprising or daring, the chowder is a simple creamy broth stocked with a good amount of potatoes and clams. Comfort in a bowl. I’d imagine this is a classic recipe that was perfected and never fussed with since. An added bonus to the Silver Lounge experience– you get to hear a local piano man play every Thursday, Friday, and Saturday night. The Quahog Republic is a relative newcomer to the Upper Cape, having opened its doors just a few years ago. It’s first location in Falmouth is a self-proclaimed “dive bar” tucked into an unassuming strip mall. The interior of the restaurant is cozy and casual, with plenty of locals at the bar and an “off-the-beaten-path” vibe. Their tap selection is impressive and they serve a mean Bloody Mary with infused vodka, bacon, and olives. 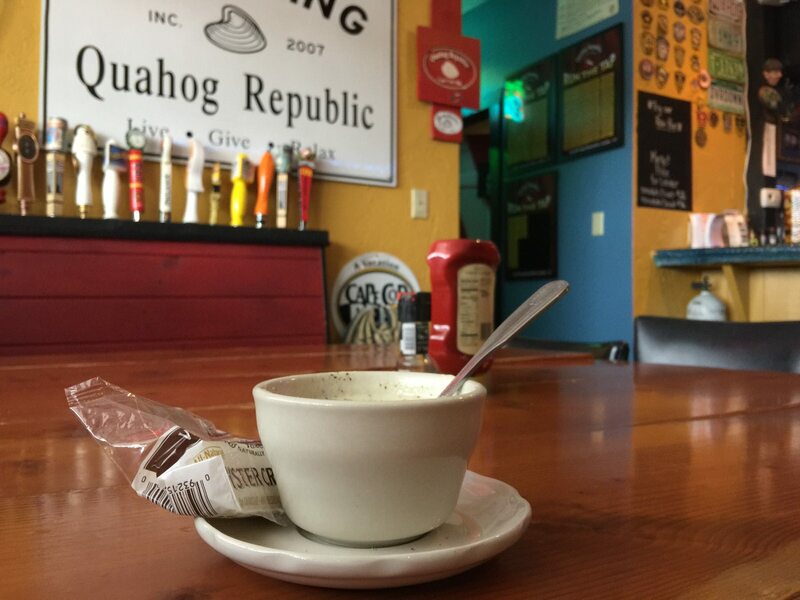 The chowder at Quahog Republic is smoky and hearty, thanks to the addition of bacon. It’s less chunky than its counterparts at the Lounge and the Trap, but comforting and satiating in it’s own right with a deliciously complex flavor. 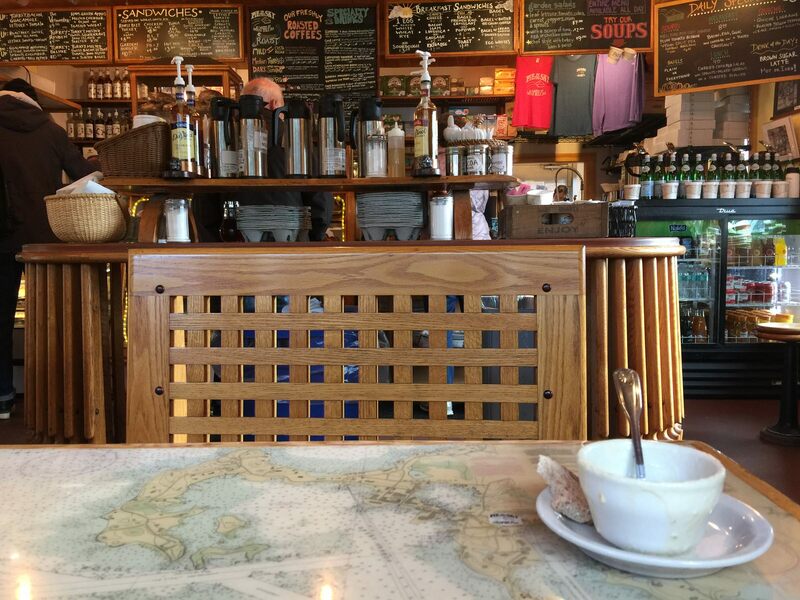 This cozy bakery is a must-stop for all visitors to Woods Hole and passengers on the ferry to Martha’s Vineyard. The interior is a little cramped, although the intimacy of sharing a table in a small space lends to its charm. The spacious outdoor patio is a great place to people-watch during summer months. The chowder here is a surprise hit. The broth is buttery and almost golden in color, and it is loaded with chunks of red-skinned potatoes and clams. A cup is served with a slice of hearty homemade bread, a welcome departure from the oyster crackers I had been eating at every other location. It was not a mistake to make Pie in the Sky the last stop on my chowder tour. Their baked goods are excellent and they roast their own coffee onsite– I finished my decadent day with a hot cup of Captain Ahab roast and a giant chocolate chip cookie. If you happen to visit “Pie” in the morning hours, opt for one of their massive popovers fresh out of the oven. My favorite part of sampling chowder was all of the lovely spots and different environments I got to visit along the way. 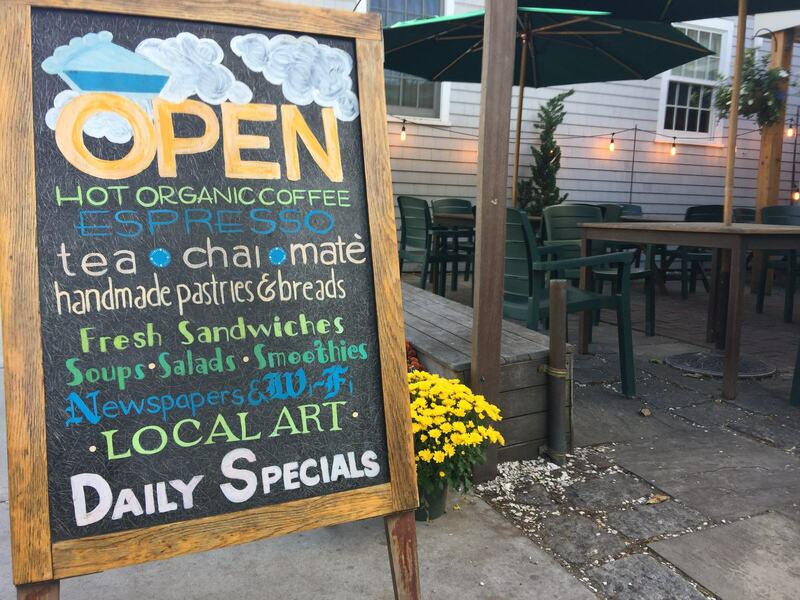 I definitely recommend a stop at any of these eateries the next time you visit Cape Cod. In the meantime, stay tuned for a chowder tour of the lower Cape coming soon. First, I need a couple of weeks to recover! EVERY PIECE OF LESTAGE® CAPE COD JEWELRY® IS MADE IN THE U.S.A. AND IS CERTIFIED BY THE RESPONSIBLE JEWELLERY COUNCIL. LESTAGE® IS NOT AFFILIATED WITH EDEN HAND ARTS OF DENNIS, MA. THE CREATOR OF THE CAPE COD SCREWBALL® BRACELET. LESTAGE® AND CAPE COD JEWELRY® ARE REGISTERED TRADEMARKS OWNED BY MARATHON COMPANY. © 2018 MARATHON COMPANY, INC.